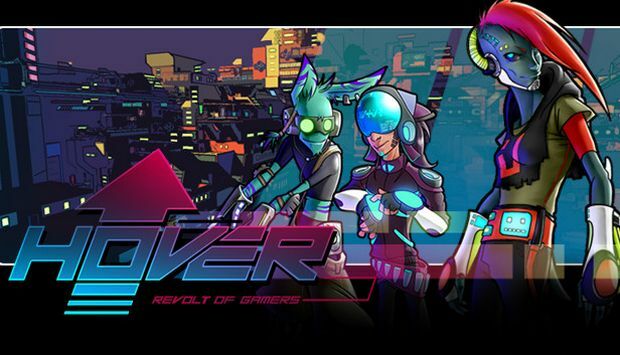 The last time we looked at Hover: Revolt of Gamers was back in July and we promised to have a hands-on in December. Well Fusty Games *just* made it in time for the end of December and we’ve been having a go. Fusty Games is a small, 3 person team from France and their game Hover is the first out of the studio. Hover promises to deliver a clever combination of Mirror’s Edge and Jet Set Radio in a simple package and, on the surface at least, provides just that. Visually, Hover packs the looks of Dreamcast classic Jet Set Radio into a refined, high definition package and it looks truly stunning. Everything is nicely stylised around the JSR artstyle, really bringing the DC style to the 21st century. It also adds some more futuristic elements to the vibrant environment, choosing purples over greys for the roads. It’s pretty much Jet Set Radio Future but actually set in the future. The JSR styling continues into the soundtrack as well, even to the point of using JSR’s lead composer Hideki Naganuma to create the soundtrack, alongside French game music artist Cedric Menendez. The general jist of the soundtrack so far is a mix of EDM style music and Hideki’s trademark “skankfunk” music. It complements the games visual style quite well and actually sounds pretty decent too. Gameplay-wise, it’s pretty much exactly the same as Mirror’s Edge, with the exception that you can fully navigate the surroundings and falling off of a building won’t kill you. It controls the same as Mirror’s Edge too, although my gripe would be that the controls could be tighter. The bulk of the missions are chase or race missions are okay but nothing groundbreaking as of yet. The missions are often poorly explained as well as checkpoints veer off in random directions making it hard to keep track of where you’re actually meant to be going, especially as you’re progressing upwards through the city. In fact, the whole game has a hard time explaining itself. Menus are often uninformative and leaving you wondering whether you actually managed to change that setting in the options screen. This bleeds out into the tutorial which is mercilessly short and seems to teach you nothing other than how to move and jump, if you somehow manage pick that information out of the pointless dialogue that’s thrown at you. It’s not helped by the fact that the English localisation is rather hit and miss, which while understandable from a small French studio, it does stand out as a bit unprofessional and untidy. Hopefully it’s something that can be fixed by release. One of the best unique features to the game, once you figure out how to do it, thanks to the poor wording in the tutorial, is the rewind feature. This becomes helpful in missions when you make a bad jump or wrong turn, which you will do. A lot. It’s also helpful in the general freeroam, in case you miss something or, as before, make a bad jump or turn. It’s also pretty cool to see you do a cool trick in reverse and something that diehard tricksters can take advantage of. There’s plenty of places to do those tricks too, with a cleverly designed, multi-layered approach to the city. It looks and feels very natural, although it feels as if there could be more utilisation of the multiple layers, and maybe a few less long stretches, especially those in tunnels, that feel a bit boring and are there to fill gaps in the cityscape. Get to the top of the area though and you’re in for a treat. With tricky jumps and gorgeous views at every angle, it’s certainly a treat to be at the top. Hover’s main selling point is the games ability to seamlessly combine JSR and Mirror’s Edge into one singular package and, with a bit of refinement, it seems to be on the verge of doing just that, which is no bad thing if you’re a fan of either of those titles. However, the game struggles to come up with any great ideas of its own and just feels like it’s just mashing two games into one, with some loose ideas thrown on top. The lacklustre missions and dire tutorials don’t help either, but both can be rectified before launch, whenever that may be. Hover: Revolt of Gamers is on the verge of excellence, it just needs a bit of a shove to get to it.